This supper is ready in about 15 minutes and uses storecupboard ingredients. Cook the pasta in boiling water, according to the instructions on the pack. In a separate pan, cook the broccoli florets for 5-6 minutes. When the broccoli is tender, drain and keep warm. Return the pan to the heat, with the olive oil. Fry the garlic, then add the anchovies, using the back of a spoon to break them down. 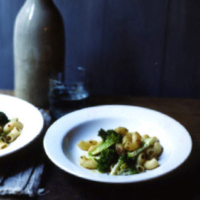 Gently fry for 1-2 minutes, then add the drained broccoli and drained pasta. Add the chilli flakes, mix well and serve. This recipe was first published in December 2009.